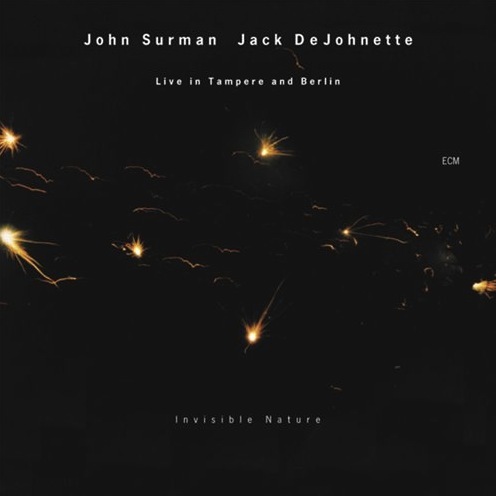 Since first recording for ECM as a duo on The Amazing Adventures Of Simon Simon, multi-reedist John Surman and drummer Jack DeJohnette have maintained a connection that finds deeper traction on the seven enhancements of Invisible Nature. Surman gurgles his way through the organ drone of “Mysterium,” which combined with a plodding bass line sounds like the seed of Jan Garbarek’s RITES. It is a silvery tapestry unspooling in flourishes that escape our ken. The music is so much of its own world that to hear applause segueing into “Rising Tide” is jarring. It reminds us that we’re still on Earth, that what we’ve been hearing has come from human hands and breath. The fantastic sweep of baritone amid DeJohnette’s frenetic pacing here elicits a wide spectrum, and charts the same balance of delicacy vs. punch that makes tracks like “Underground Movement” and “Ganges Groove” such inspiring excursions. Painting his snare like the eye of a hurricane, DeJohnette crystallizes steady grooves for Surman’s cerebral and biologically direct highs in the former, while in the latter he paints with his tabla generator a scene as lush as it is arid. “Outback Spirits” makes gorgeous use of digital delay in a trip filled with cinematic tension, equal parts Nicolas Roeg and Stanley Kubrick. It is the elegance of uninhibited joy, the patter of the disembodied. A welcoming freedom of expression prevails. “Fair Trade” is the masterwork of the collection and shows the depth and breadth that these two legends are capable of when the gloves come off and all that’s left to feed on is fire. Between the crunchy baritone and DeJohnette’s astonishing ear for space, there is more than enough to savor for future listening. “Song For World Forgiveness,” the only piece not entirely improvised, floats a swanky bass clarinet on a river of lipstick and smoky alleyways: an homage to roots, to loves, and to new beginnings. For all the trickery, there is at this album’s core a duo of infinite potential, one that walks a tightrope—blindfolded—across wide canyons. The nature of this music may be invisible, but man, is it ever audible. Hello again Tyran. And thanks for all the continuing reviews. I’m quite sure that there exists a much earlier recording-I believe from the late 1960’s of Surman and Dejohnette as a duo, just for your information. I know Dejohnette has lived in upstate NY for many years and I believe that in the late 60’s that Surman was also living there for awhile. It seems that these 2 got together way back then and actually recorded a live album for a small European label (not ECM) of a live performance in the Woodstcik NY town hall. I’ve actually been to the town hall-it’s quite small with no actual stage-the musicians just play at the front of what appears to be a town hall meeting room. It would have been great to see them that close up in such an intimate setting. Thanks for the correction, Gary, which is now reflected in the first line of my review. These are precisely the kinds of details I miss out on having not grown up, but into, this music. And you’re welcome for the words. I just can’t seem to stop!